Toyota Prius has been ranked as one of the most popular & fuel-efficient hybrid options , The buyers can choose between two batteries and this has an impact on the price point , The interior and cargo area has been retooled to provide more useful space . Toyota vehicles have high quality & they have a great value , Toyota is a sturdy and family-appropriate car , It is considered one of the leading brands in retaining resale value , You can expect to get a nice trade-in price years down the road when it’s time to buy your next car . 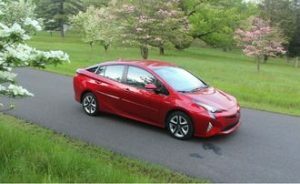 2016 Toyota Prius is a superb choice for anyone who is looking for a reliable hybrid , It has a more traditional driving experience than previous models , It is boosted by performance & styling updates , This hybrid presents a smoother , quieter ride which is no longer plagued by a loud , labored sounding acceleration . The base model offers an impressive 50 MPG during city driving that makes the Prius a solid choice for the people who are looking for a fuel-efficient vehicle , Although the back-end styling leaves much to be desired , the other interior and exterior revisions are all nice additions . Toyota Prius is one of the most popular eco-friendly vehicles on the market today , The drivers can expect over 45 miles per gallon from this remarkable hybrid , It received high crash test safety ratings from the NHTSA , making it safe as well as an environmentally conscious choice for you & your family . The quicker response time helps the Prius compete with non-hybrids , Road holding and handling are smoother & more satisfying , Toyota New Generation Architecture is responsible for these performance improvements . If we are looking for the hybrid to improve our fuel efficiency , 2016 Toyota Prius is a wise choice , Basic model boasts 50 MPG for city driving , The drivers who opt for 2016 Prius Two Eco can expect up to 58 MPG on the highway . The interior of the vehicle has wonderful improvements over the last year’s model , It only makes noise while it uses gas to recharge the batteries and it doesn’t require much maintenance , just a synthetic oil change every 10,000 miles . The front seat cushions have more bolstering & they have a better shape , Soft-touch materials are more prevalent , The improved dashboard helps complete this year’s notable boost in interior comfort and quality . Insurance Institute for Highway Safety gave 2016 Toyota Prius models an average rating of Good that is the top score available , Each of these cars comes with eight airbags and the consumers can upgrade the Safety Sense system in select models . The hybrid cars comes with a lack of cargo space , while 2016 Toyota Prius does not have this issue , Prius increased cargo space that rivals all hatchback models , including standard fuel options . The consumers can choose between six different trims , and each has its own unique styling features , These trims come in three categories which are Two , Three and Four , 2016 Toyota Prius Two is the base model and it has 15″ wheel covers . The Three and Four offer alloy wheels and the option to purchase the Touring Edition , The Three and Four provide the Advance Tech and Premium Convenience add-on packages , 2016 Toyota Prius comes with enhanced features , The standard features such as heated power folding door mirrors that are available for each 2016 Toyota Prius model . The upgraded Three and Four trim levels expand upon the basic model with practical bonus features which enhance the driving experience , The Four comes with blind spot monitoring and power lumbar support , The Three features smartphone charging and Entune Premium Audio . 2016 Toyota Prius comes with several notable exterior alterations , It is slightly longer , wider and lower than last year , The visual height is reduced with a nice accent line which goes across the doors , The unit that houses the front LED lights has become smaller . 2016 Toyota Prius is never going to compete with a sports car , but the acceleration has been improved , The acceleration noise is greatly reduced , 2016 Toyota Prius still has great amount of storage space for us , Keyless entry , push button start and backup camera are great . The visual design of the rear light units leaves much to be desired , The spoiler is still a polarizing addition to Prius , Back-end design is not aesthetically pleasing , Front and sides of this year’s Prius offer a nice improvement over the 2015 model , but the back-end is the vehicle’s least attractive feature . Prius Two does not come with the most exciting features , Base model contain many features which make it worthwhile , but budget shoppers do not have the option to upgrade the Two to include the new battery , alloy wheels and the add-on packages . Monthly payments will be higher when you buy a new Toyota , Over time , you can expect to have repair costs , Toyota seems to run through good tires every two years now and it would be expensive to replace . Tags: 2016 model2016 Prius Two Eco2016 Toyota Prius2016 Toyota Prius benefits2016 Toyota Prius cons2016 Toyota Prius disadvantages2016 Toyota Prius features2016 Toyota Prius models2016 Toyota Prius performance2016 Toyota Prius pros2016 Toyota Prius review2016 Toyota Prius safety features2016 Toyota Prius Two2016 Toyota Prius usesCargo areaCargo spaceEco-friendly vehiclesFuel efficiencyFuel-efficient vehicleHybrid CarsHybrid optionsNon-hybridspriusResale valuetoyotaToyota New Generation ArchitectureToyota PriusToyota Prius consToyota Prius prosToyota vehicleWhat's New for 2016Toyota Prius ?